Carbon fiber construction creates a sleek exterior on the StingSport, adding to its performance. Visibility from the StingSport is expansive through the clear bubble canopy. The swept forward trailing edge of the wing is tapered for weight and speed purposes. Sport pilots cannot fly the retractable gear version, shown here. The large clear canopy pivots forward on a hinge at the front of the canopy and locks on both sides and at the rear. Dual gas struts assist in raising and lowering the canopy. Entry is gained by stepping up on the wing root and lowering oneself into the cockpit. The StarSport, a sister ship to the StingSport, is built from the same molds as the StingSport. The differences are that the StarSport is constructed of fiberglass, has a Hershey-bar wing, and the elevator is a full-flying stabilator|and it costs less| 58,850 euros (about $72,000). A complete instrument panel greets potential StingSport owners, as is depicted here. In addition, a Grand Rapids Technologies EIS, Garmin 295 GPS, and Icom VHF receiver are also standard. Full dual controls make the aircraft suitable for training. The slab-style main landing gear is constructed of Kevlar and fiberglass. The nose wheel strut features a spring inside the tube to even out landings. Flaps extend to 15 and 35 degrees. 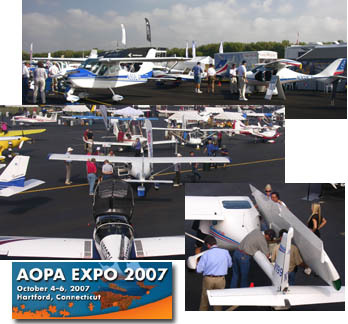 The aircraft displayed at EAA AirVenture Oshkosh 2004 still carried the StingCarbon name used previously. LSAeligible Stings will be called the StingSport. Four-point shoulder harnesses are also standard equipment. A 20-pound capacity storage compartment is located behind each seat. The raised lever between the seats is the flap handle, showing the flaps at full deflection. The button on the end of this lever is the lock for the flaps. Empennage detail-the elevator (and ailerons) is controlled by single pushrods, while the rudder is controlled by a cable. The elevator on the StingSport is a conventional trailing elevator. A fully loaded, top-of-the-range aircraft Eastern European aircraft are expected to factor massively in the coming wave of light-sport aircraft (LSA) available to Americans. Several designs have already begun to attract interest as we get closer to approval of the ASTM International consensus standards that will govern the design, construction, and maintenance of these machines. One airplane that generated significant interest at EAA AirVenture Oshkosh for the last three years is the TL-2000 Sting. Common to designs we're seeing from Eastern Europe, the TL-2000 Sting from TL Ultralight in the Czech Republic is a sleek, composite aircraft with impressive performance and handling. The Sting series evolved from an earlier TL Ultralight design called the TL-96, and both aircraft cater to the European ultralight market, which has allowed the manufacture of LSA-category aircraft under European microlight regulations. Now, the TL-2000 and TL-96 are being reworked to meet LSA requirements. The planes have been renamed the StingSport and StarSport respectively to designate the aircraft that will be LSA-compliant. When I flew the TL-2000 Sting (now the StingSport) at EAA AirVenture Oshkosh 2002, it was represented by Australians Michael Coates and Phil Allen. However, the Czech factory had concerns about how the Aussies could properly service the American market from so far away, so the StingSport and StarSport are now represented in the United States by Bill Canino of SportairUSA, based in Little Rock, Arkansas. 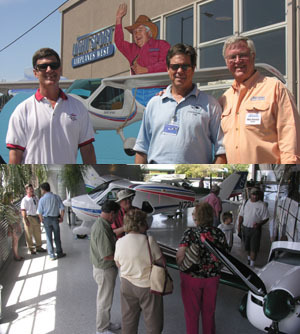 Coates, who still distributes the Sting series in Australia, also sells several other interesting light sport aviation products in the United States, and he and Allen remain regulars at EAA's annual conventions. SportairUSA also has distribution rights for Canada, but Canino is training Darrell Lynds to take over representation in Canada. Lynds' company is called LS Aerospace Ltd., but it is new enough that Canadian readers should contact the SportairUSA number for referral. In addition to StingSport and StarSport, SportairUSA represents the American-made SeaRey amphibian and a fast "supermicrolight" from Germany called the Impulse. Variations on the Theme TL Ultralight's changing product line reflects the evolving European ultralight market. Once Europe embraced trikes; not long ago those weight-shift aircraft made up more than half of all aircraft flying at recreational airfields on the European continent. Logically, TL Ultralight made a trike, called the TL-22 Duo/Eso. When Europeans began switching to three-axis aircraft, the Czech company built a tube-and-rag airplane called the TL-232 Condor, based loosely on the RANS Coyote. 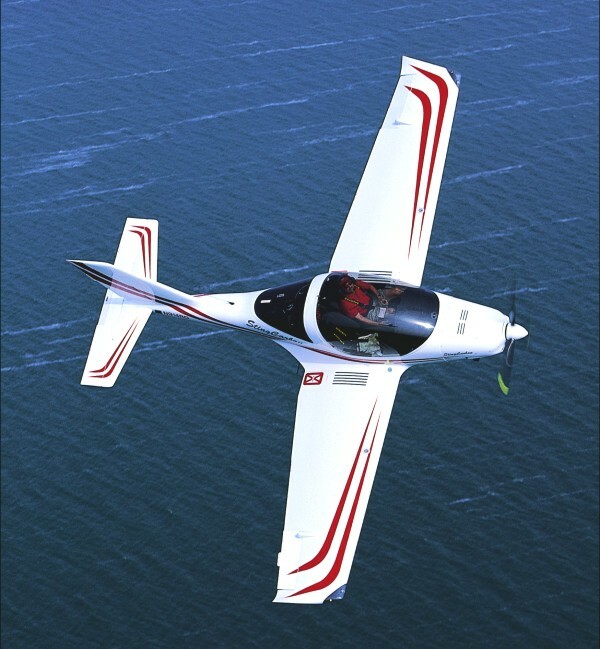 After the Condor, TL Ultralight made the leap to composite aircraft with the somewhat boxier, all-fiberglass TL-96 Star. To date, it reports producing more than 300 Condors, 174 Stars, 116 Stings, and 18 Sting retractable-gear aircraft. (Trike sales were not reported.) The StingSport followed. This more refined aircraft is 85-percent carbon fiber, which lightened its structure (but not its strength) and allowed more features at the same gross weight as the StarSport. The main difference between the two models, other than the material used for construction, is the wing design. The StingSport has a swept forward trailing edge to aid maneuverability, while the StarSport has Hersheybar wings and more docile handling, which might make it better suited for training duty. Features Galore on the StingSport All TL Ultralight aircraft sold by SportairUSA have a ballistic emergency parachute system for the airframe. They also have a ground-adjustable, three-blade propeller, and the standard engine is the 80-hp Rotax 912. The XS version of the StingSport will be powered with the Rotax 100-hp 912S. The StingSport has several userfriendly features, including electric start, cabin heat, rotating ventilation windows, locking gas cap, cabin-locking mechanism, two map pockets, a utility shelf, dual four-point safety harnesses, upholstered seats, fabric-covered glare shield, side panels, an aft storage area, a fire extinguisher, and full dual controls at both seats that include elevator trim, two-position flaps, and independent hydraulic brakes. Standard instrumentation on the StingSport includes airspeed indicator, altimeter, vertical velocity indicator, slip indicator, magnetic compass, tachometer, and the new TruTrak pictorial pilot turn and bank indicator. Complete engine monitoring is accomplished with Grand Rapids Technologies' engine information system (EIS). All StingSports also come with an Icom IC-A200 VHF 760 transceiver with VHF antennas and two headset jacks with holders. A Garmin 295 color global positioning system (GPS) is also listed as standard equipment, built right into the panel. A transponder, including mode "C" altitude reporting, is also included. The main fuel tank holds 18 gallons. The tank is located under your knees as you sit in the aircraft. The purpose for this configuration is to allow Europeans who commonly trailer their aircraft to do so in greater safety, but it also makes wing removal easier and lighter. A fuel filler cap is flush mounted on the right side of the aircraft with an anti-tamper, keyed lock. Auxiliary tanks in the wings can add 12 gallons more for truly longrange capability. The StingSport's wing is dry, unless you order the optional long-range tanks. A storable tow handle will help owners move the plane around in hangars or on the ramp. The StingSport has removable but not folding wings. The factory says the wings can be removed in 15 minutes. You remove three screws to take out the seat first. Once that's removed, you undo two bolts for the ailerons and unplug the strobe wires and pitot tube connection. Finally, after removing a safety nut on the rear spar, the heavy center pin can be extracted, which allows both wings to be unplugged. The safety pin must be rotated 90 degrees, and other components have to be moved to accomplish this, so it is impossible to do without some effort. The rudder and horizontal surfaces are also removable, making the Sting transportable by trailer, and possibly saving hangar fees if you can store it in your garage or other facility. The main gear legs are slab style, made of fiberglass and Kevlar. The nose wheel strut uses a spring inside the tube. The entire outer surface of the StingSport is carbon fiber. Engineers installed four fiberglass ribs inside each wing as added support, even though the structure of the wings was strong enough without the ribs. The seat structure and a few bulkheads in the aft fuselage are also made of fiberglass, but the remainder of the structure is carbon fiber. Choosing to use carbon fiber was done with a close eye on the cost/benefit ratio; the strength of the wings shows the wisdom of that choice. TL Ultralight is so confident about the construction that it recommends a 5,000-hour or five-year inspection of the airframe. Getting In Entering the StingSport involves the customary step on the wing root and lowering yourself inside the cockpit. Once inside, the StingSport's immense clear bubble canopy locks down in three places-one on each side and one centrally located at the rear of the canopy. Dual gas struts on either side of the canopy ease the opening effort and would seem to prevent problems with opening the canopy in mild winds. It offers excellent visibility, and the optical quality of the "glass" seemed to be good. Aft viewing allows you to see the tailplane clearly. After you close the canopy, a defroster air intake will help keep the surface clear in all weather conditions. During Oshkosh's summer heat, it got pretty warm inside the cockpit without a sunshade. Supposedly you could taxi with the canopy open a bit, but things tend to get sucked out, so it isn't really advised. A lever on the pilot's left opens up an air vent that brings in plenty of fresh air. This is in addition to rotating air vents on each side of the canopy. We obviously didn't need it on our flight during EAA AirVenture, but the StingSport comes with a heating system that would be appreciated during a Wisconsin winter. The seats are adjusted by foam pads that attach by Velcro to the back of the seat. If that isn't enough, the rudder pedals are also adjustable. 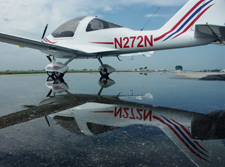 A tall pilot of 6 feet 4 inches will be close to the canopy top, so the factory offers lower profile seat cushions to help tall pilots fit into the space, with limits. Your choice of seat arrangement and cushions is made when you order the aircraft. You simply specify your needs by supplying some measurements. Luggage compartments behind the seats can accommodate a total of 40 pounds, and the spaces are easily accessed. Typical empty weight of the StingSport is around 744 pounds, says Canino. With the addition of any optional equipment your base weight will increase obviously. But if you assume a 760-pound empty weight, with a gross weight of 1,320 pounds, you will have 560 pounds of useful load. Even with 18 gallons of fuel, you can still have two 200-pound occupants and full baggage. Your total useful loadwill, of course, depend on the actual weight figures for your aircraft. Time to Fly At EAA AirVenture Oshkosh 2002, several people urged me to examine (and fly) the Sting. When the opportunity arose I jumped at it. Hydraulic disk brakes held us quite securely while operating on the paved ramps of EAA AirVenture's North Aircraft Display area. After a lengthy taxi-sweltering under that all-clear canopy even with vents-we were number one for takeoff. Rotation can be done at 40 knots (46 mph), though we used 50-55 knots to accommodate a crosswind condition. Climb can be done at 60 knots (69 mph), but the angle is steep. You'll be able to see better at 70 knots (81 mph) of climb speed. Though you can order the StingSport XS model with the 100-hp Rotax 912S, the 80-hp 912 provides suitable takeoff, climb, and cruise performance when matched with a ground-adjustable three-blade propeller, Canino says. The aircraft I flew had a constant-speed prop. An automatic propeller indicator allows you to press and hold a button that will set the prop in climb position for takeoff. Should that computer fail, another backup control is located between the trim and the throttle with an indicator in front of the pilot that shows the angle of the prop. It blinks as you reset and holds steady once you've arrived at your chosen setting. The prop control is interesting, showing an actual number. It comes preprogrammed with settings so the pilot can hit one button that changes the engine revolutions and prop speed without further input. However, constant- speed props can only be used on StingSports built and certificated in the experimental amateur-built (51-percent) category; LSAs are limited to fixed-pitch or ground-adjustable propellers only. Once we got away from the hubbub of EAA AirVenture, I tried backing off on the power in this StingSport. At one point, while flying at a calculated 45- percent power, we were indicating 4800 rpm and producing 125 knots while the prop was showing 1940 revolutions. With this model constant-speed propeller, as you pull aft on the throttle, the prop speed is adjusted automatically. You can reduce it enough to cut fuel consumption to 3 gph and still make 115 knots. Of course, a fixed-pitch prop will provide some different performance parameters. According to Canino, typical cruise fuel flow is about 4.5 gph, burning premium auto fuel. Low-level, high-speed cruise will use about 5 gph. With the standard 18-gallon tank, you'll have three hours of flight time with a reserve. "We fly 3.5 hour trips at 75-percent power and top off the tank with less than 15 gallons," says Canino. If you order the wing tank option-12 additional gallons-you can boost flight time to more than six hours. Throughout the flight envelope, I found the controls light and responsive. Full ball-bearing turning blocks make for smooth controls. They need only a light touch. Some acclimatization may be needed to master the StingSport's controls, but the learning curve is not particularly long. Steep turns were effortless, and little additional power was needed to sustain altitude. Power-off and -on stalls required only a mild recovery technique and should not be threatening to less-experienced pilots. Many will appreciate the standard emergency airframe parachute. For landing, we used one notch of flaps. Flaps are available at 15- and 40- degree deployments. You must take care not to put the flaps out until you've slowed to 77 knots (89 mph) for the 15-degree setting and 65 knots for the 35-degree setting. The StingSport is slick enough that you need to watch your speed closely on landing so as not to exceed flap deployment limits. Final approach can be made at 65 knots (75 mph), and you can slow to 55 knots on short final where with full flaps you should descend at about 500 fpm. Because the StingSport is faster than many American-made LSAs, it will eat up more ground roll and generally demand a somewhat longer airstrip. Speaking of getting the detail right- a static discharge wire on the right wheel makes contact on landing to let you know you're down. Again, I'm impressed with the level of engineering on the StingSport. Is It Your Bird? According to Canino, both the StingSport and the StarSport will comply with the LSA ASTM standards. He notes that the new rule allows planes to be offered as 99-percent kits, and that's the primary route SportairUSA will likely take. He says the 99-percent experimental light-sport aircraft (E-LSA) kits will be "very complete. We expect the kits to be completed in as little as 16 hours at one of SportairUSA's Air Safety Training Centers," reports Canino. "Dealer training in construction, assembly, and ground and flight instruction is included as part of the purchase investment in the aircraft." Canino also hopes to offer an FAAapproved course that will allow the owner to earn a light-sport repairman certificate with an inspection rating. With that, the owner can do the annual condition inspection. If you choose to have maintenance and inspection done by some other FAA-rated mechanic, SportairUSA's course will help you explain to a mechanic specifically what you think is necessary to keep your aircraft in safe operation. Because of the extremely high costs of liability insurance, SportairUSA anticipates only limited production of fully built special LSAs. The Czech TL Ultralight factory is also willing to supply 51-percent-compliant kits, so that will be another option for builders. If built according to LSA standards, the aircraft can be flown by sport pilots; otherwise, the builder will need to have a minimum of a recreational pilot certificate or higher. 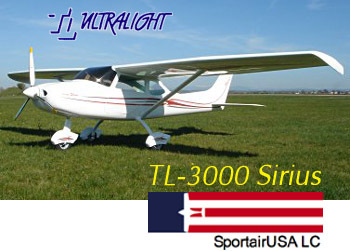 Of course, a recreational or private pilot or higher can fly any of SportairUSA's aircraft. 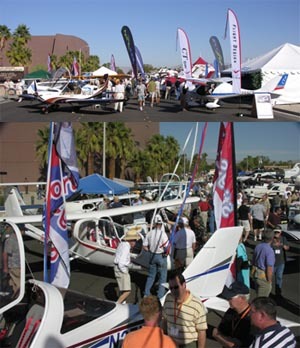 By Sun 'n Fun 2005, Canino expects to have 51-percent kits available for the Sting model with retractable landing gear. However, the retractable model does not qualify as a LSA, which is limited to fixed or repositionable gear, such as on the SeaRey. The carbon StingSport is a complete and deluxe airplane. Compared to the CT2K or Remos G-3 Mirage, the StingSport is priced competitively. 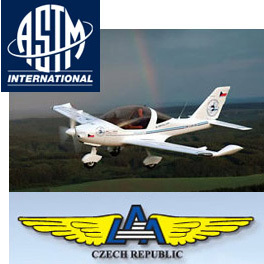 Like many importers, SportairUSA lists the price in euros-the currency it must use to purchase the planes from the Czech Republic factory. Currently, the StingSport lists for $65,850 (Euro), before shipping. At press time that translated to a little more than $80,000 (US) plus shipping. Dollars or euros, you'll spend more on a StingSport than some other LSAs, but you'll have a dynamic and satisfying flying machine that will turn heads at most airports and give you many years of enjoyable flying. Notes: 1 Typical empty weight is more than 700 pounds, as noted in article. A fully loaded, top-of-the-range aircraft Eastern European aircraft are expected to factor massively in the coming wave of light-sport aircraft (LSA) available to Americans. Several designs have already begun to attract interest as we get closer to approval of the ASTM International consensus standards that will govern the design, construction, and maintenance of these machines. One airplane that generated significant interest at EAA AirVenture Oshkosh for the last three years is the TL-2000 Sting. Common to designs we’re seeing from Eastern Europe, the TL-2000 Sting from TL Ultralight in the Czech Republic is a sleek, composite aircraft with impressive performance and handling. 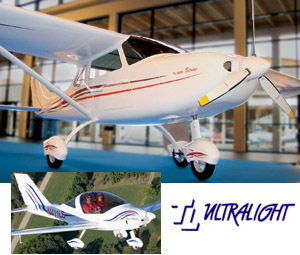 The Sting series evolved from an earlier TL Ultralight design called the TL-96, and both aircraft cater to the European ultralight market, which has allowed the manufacture of LSA-category aircraft under European microlight regulations. Now, the TL-2000 and TL-96 are being reworked to meet LSA requirements. The planes have been renamed the StingSport and StarSport respectively to designate the aircraft that will be LSA-compliant.